I know it is so lame to talk about the weather all the time... but it is H-O-T here, and this fact directly affects my fashion choices... so now that I have justified my right to talk about the weather... I am going to! So how do I stay cool, save attempting indecent exposure? Hats, breezy skirts, and loose, but body flattering silhouettes ... oh and sweet tea! Case in point... this black maxi dress is a LOT of fabric, but the fact that it is loose and light, actually helps keep me cooler than I would be if all my haven't-seen-the-sun-in-months-skin was out and exposed! So expect to see this and other maxi dresses in HEAVY rotation in the coming months! P.S. I am liking up to Marionberry Style's Trend of the Month Challenge - it is "Yellow", and I can't wait to check out everyone's sunshiny looks! I am LOVING the yellow with the black dress! This is something I am scared to do becuase I have convinced myself I would be a walking Bruins advertisement (I am, anyways, by the way) but your outfit has changed my mind. I think the mostly black with hints of yellow is perfect! LOVE that maxi dress. and i LOVEEEE it with the necklace! So cute! Love the maxi and it is perfect with the necklace! I just bought a yellow one from Hong Kong.... hasn't arrived yet, but I want it so badly, especially to pack to Europe! Adorable look! Loving the pops of color! Very cute outfit! I hate the heat! It get to 115 here but we don't have the humidity. I don't think I could stand it if it was humid and hot! So so cute! Love the shoes and the yellow! Yes, I like the black and yellow in your outfit. Sometimes I feel a little bumblebeeish or Kill Billish with the black and yellow, but this is really fun! You can never go wrong with a simple black dress! LOVE the yellow accessories! I love sweet tea...actually have you ever had Arnold Palmer (half iced tea, half lemonade)? It's amazing! You look sooo comfy! That dress is super flattering on you. Great wedges & love the yellows! I totally agree...maxis all the way when it's hot! yellow and black looks gorgeous on you! love that necklace! Oh I will cross my fingers that your necklace comes in time.. . Europe! That sounds amazing! Thanks lady! And yes, these wedges are perfection - not only were they less than $25, but they are going to be a summer staple in my closet and super comfy! FAB look! LOVE the necklace! adorable!! It was super hot here this weekend and I wore a black maxi dress too - it is light and cool. love the yellow too! Thank you lady! 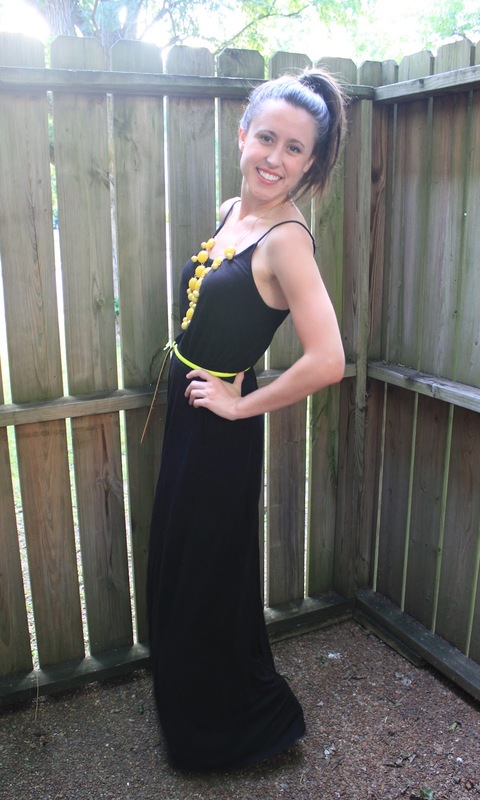 I have two maxi dresses... they really are so perfect for surviving the hot summer days! Thank you! Cold and raining?! I can't even imagine... so funny! Thank you! Oh man, the humidity is the deal breaker... not to mention how much my hair HATES it! Guess after 25 years, I just have to accept it! So cute! Girl I know what you mean about the heat. I live in Louisiana and it gets up to 100 degrees plus some in the summer. I really don't think I can live here the rest of my life! You look super cute by the way. Love the whole ensemble. I hear ya on the weather...it was 102 degrees in Austin today!!!! I am in LOVE with that bubble necklace!!! I need to grab one off ebay stat!! Oooh, now this is one gorgeous look! I love the maxi dress and the yellow accents you added. Eek, I LOVE that maxi dress on you! Jessica - you look so beautiful and ready for summer! That necklace looks perfect with the dress (not sure I've seen it with a maxi before...LOVE it!) Thanks so much for linking up girl!